Fashionable Flip Flops? Is That Possible? Yes, They Exist. It’s 5pm, you’re still at the beach. Your hair is all salty, you’ve drunk a little too much rosé (not driving!) and got a little too rosy (don’t forget the SPF next time!). You’re juggling your towel, books, empty glass, sunglasses, beach bag… Do you really want to start the process of tying up your gladiator sandals to boot? The flip flop becomes a summer essential for pure practicality. No, there is NOTHING fashionable about a pair of rubber flip flops. They’re akin to the Ugg (don’t be too quick to knock those either though!) or the Croc (ok, go ahead and knock those. On second thought, don’t). 1- Are you really going to wear a pair of $800 flip flops to the beach (if you’re an Olsen, don’t answer that — wait, Mary-Kate wears rubber flip flops)? 2- Does another pair of summer sandals exist that’s so easy to slip on and off? Sure you could slide into a pair of, uh, slides. But think about the leather mixed with the salt water on your toes. If you’re looking to get from the beach to the car without a fuss. The rubber flip flop is a must. If you’re looking to hit Cheval Blanc in St. Barths on New Year’s Eve, uhhh, ummm, try the pair from the Row instead. There’s a time and a place for a flip flop and in the summer, a pair of plain flip flops becomes a must. Just because you’re going to risk your cool-status on a pair of ugly black flip flops doesn’t mean your outfit has to (ugh) flop. 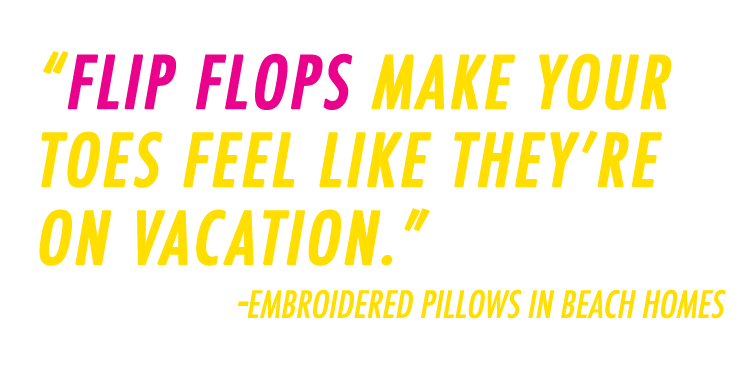 If you’re doing summer right, read: At the beach — a lot, you have to have a pair. Kate Moss wears flip flops (now and then), so that means they’re cool… Right?